According to the project README, Kippo is no longer maintained and has been superseded by Cowrie. This article may still be useful as a reference, but may not follow best practices or work on this or other Ubuntu releases. We strongly recommend using a recent article on Cowrie, Kippo's successor project, written for the version of Ubuntu you are using. 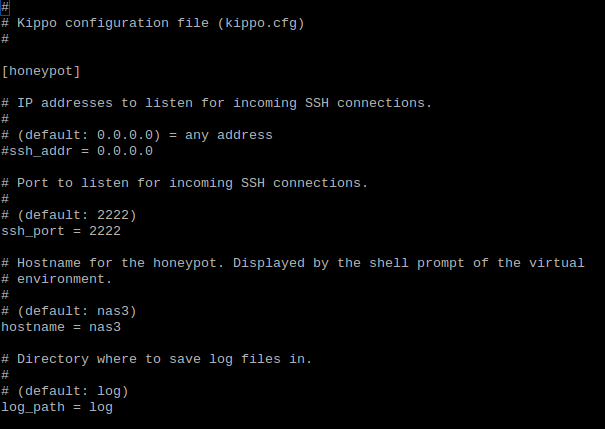 Kippo is a SSH honeypot tool writen in Python that can log brute force attacks and the shell interaction performed by the said attacker. In this tutorial, I will show you how to setup Kippo and also how to add a simple solution which can help prevent brute force attacks on your cloud server. As qoute by desaster, creater of Kippo, "By running kippo, you're virtually mooning the attackers. Just like in real life, doing something like that, you better know really well how to defend yourself!" If you wish to learn more about kippo, please click here. Please note: This guide assumes you already know how to create a cloud server. If not, please follow this guide before continuing. Furthermore, this is based on a fresh installation of Ubuntu 12.10 x32 server. Kippo logs everything that has been accessed via port 2222. But most automated tools which are used by hackers, default SSH to port 22. Thus, it would be a good idea to make kippo listen to port 22 instead. To do this, we need to change the port which your server uses for SSH. It is also good practice to change your SSH port for security issues, but you have to remember this when dealing with other 3rd party programs. From now on, I will be using vi as my text editor. If you use something else like nano, just replace vi with nano. We need to change the port number to something else. In this example, it will be 8925. This should be the expected outcome. Save the file and exit into your terminal. On linux systems, the root user is the only user that can run ports below 1024. It's also not a very good idea to run Kippo as root for security reasons. There has been a lot of discussion at length on this topic. But in this tutorial, we will use AuthBind for its ease of use. 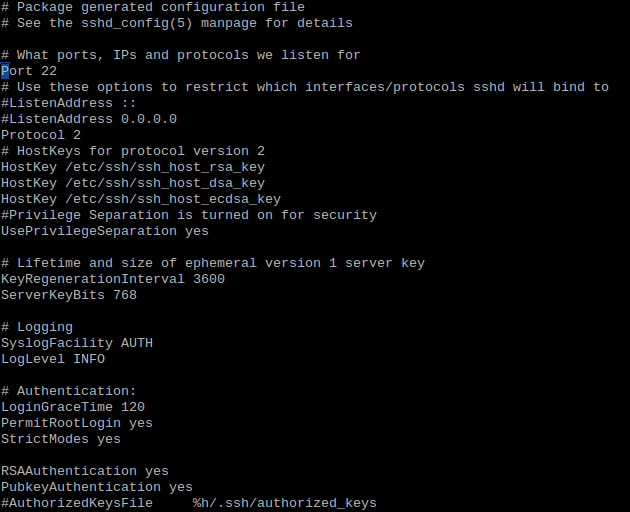 At this point, it's a good idea to edit kippo's startup script to use AuthBind for our SSH solution. As long as our start.sh script is running, our events will be logged in /home/kippo/kippo/log/kippo.log. Lets open that file with a text editor (of your choice) and see what has been logged (I am in the directory which we said above). 2013-05-09 00:34:55+0000 [-] Log opened. 2013-05-09 00:34:55+0000 [-] twistd 12.2.0 (/usr/bin/python 2.7.3) starting up. 2013-05-09 00:34:55+0000 [-] reactor class: twisted.internet.epollreactor.EPollReactor. First of all, the log file is opened so that kippo is able to make additions. We fire up our python enviroment. From here, on the 3rd line of our log, we define our event loop (If you wish to learn what that is, click here). Our Kippo enviroment gets set to port 22 which we specified in our configuration file earlier. Finally, we initiate our factory enviroment which will do the bulk of the work of which Kippo does. Now this is where the logging of intruders will be displayed. As you've seen before, we are still able to connect through the default SSH port 22. But remember that this is a dummy access point. This is what we want our intruder to believe when they're "hacking" our cloud server. This is key because now this gives us the ability to log the users information and what is entered into the terminal window. Now as you see, kippo has logged that there has been a connection detected when the attacker tries to into the server with SSH. As you can see, we catch their IP address and what port they're using (note the port 22, our dummy default port). If you look back on the "hacker's" machine, you will see the regular RSA (algorithm) fingerprint identity pop up, something that you would normally see if it was your first time logging into your cloud server. It instantly tries to connect us through a SSH key, but it fails. The log also detects that our "hacker" is using the keyboard in his terminal window and once an action is complete, it will log it. Here we see that the "hacker" tries to enter a password, 'chccbcaqkyoz', for the root user. Of course this will fail, but we would like to see what they've entered. This will go on and on until the user quits, which is when the connection is lost. There is a lot more to this tool and you can play some mighty tricks on people if you like. But the main thing to remember is, always be weary about what you do on your cloud server. Think security before doing anything. Doing so will help you in the long run if you need to scale, hold more sensitive data, and a whole lot more. I would recommend you to make sure you are changing default port settings for you server on a regular basis, like we did in this tutorial for SSH access. This will go a long way, plus you can do stuff like we just did! In addition, check out the source code of kippo. It will give a better understanding of what this tool does. Now, go use the password '12345' and find out what else is logged!